She’s done it again… Katie Waissel survived the X Factor sing-off for the fourth time, meaning a shock exit for Aiden Grimshaw. 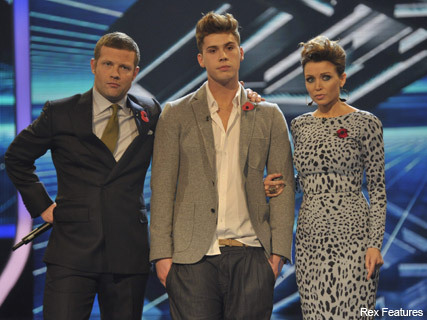 SEE ALL THE ON-STAGE ACTION FROM THIS WEEKEND’S X FACTOR HERE! There’s one thing for sure, Katie Waissel doesn’t give up without a fight. The 24-year-old found herself in the bottom two for the fourth time last night, singing for survival against 18-year-old Aiden – who had never found himself in the sing-off before. And with the judges unable to agree on a majority vote, the decision was taken to deadlock and therefore back into the hands of the public. And sadly for Aiden, more viewers had picked up the phone for Katie, and she scraped through for another week. As Dermot declared the result, nobody seemed more shocked than Katie herself, with the announcement prompting loud boos from the studio audience. Visibly shaken, the emotional singer launched a hug on the seemingly impassive Aiden – who was clearly unimpressed with the results. A spokesman for the X Factor has since insisted that no one knew the outcome of the result until just seconds before it was announced by Dermot. ‘People make lots of unfounded predictions on the internet about the order of contestants based on various popularity polls. We do not believe there is a leak,’ they said. But what did YOU think of the Sunday night result? Did the right person leave? Let us know your thoughts in the comments box below!